ACS Battery Port with Inductive Charging Coupler: Accepts removable, rechargeable batteries of varying capacities. Closes invisibly during normal use; click included battery meter to open for access to battery. Settings can be changed while battery is removed. ACS Battery Box: Required to hold spare batteries when not in use. Buy one if you want to be able to replace a unit’s battery. 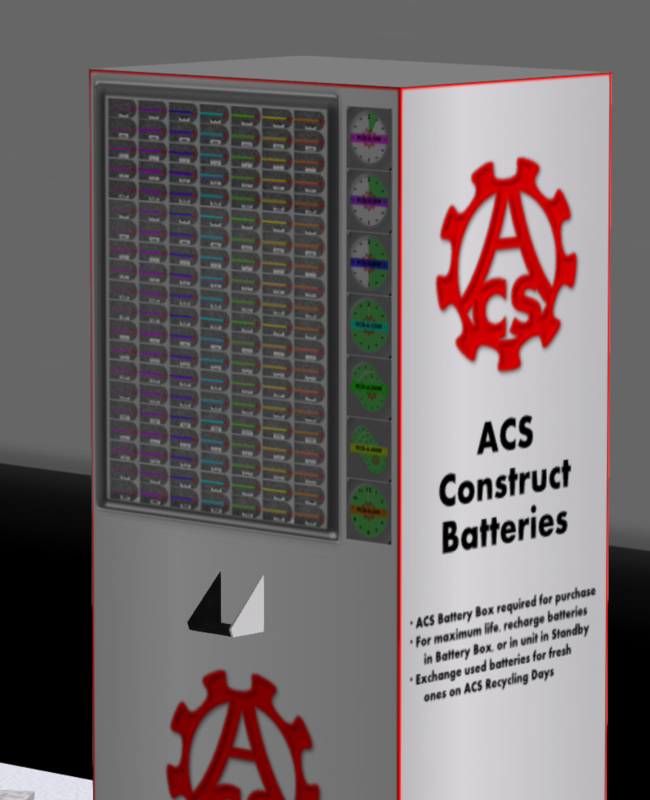 ACS Battery Vendor: Sells Class A Batteries of capacities ranging from 10 minutes to 24 hours. Be sure to buy a Battery Box first! ACS Class A Batteries: Used with ACS Battery Port. Varying capacities. Degrades over time, especially when charged in an active unit. 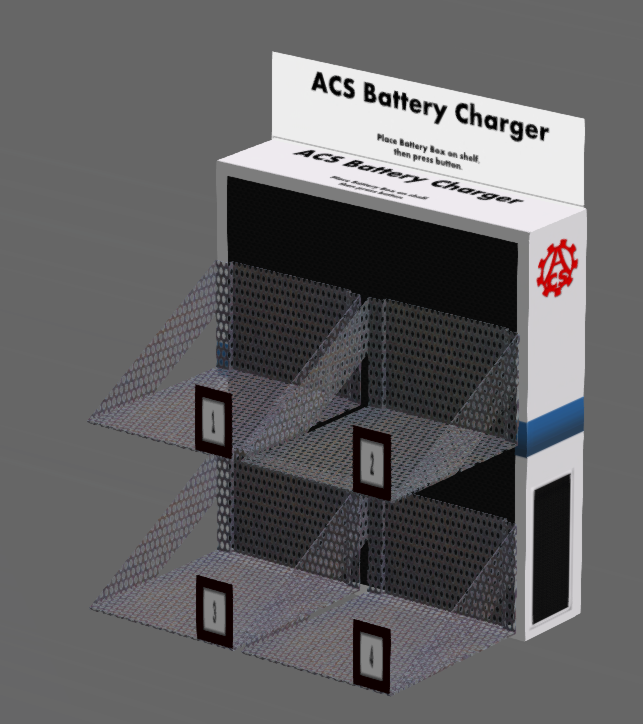 ACS Battery Charger: Recharges all the batteries in up to four Battery Boxes at once, without degradation. 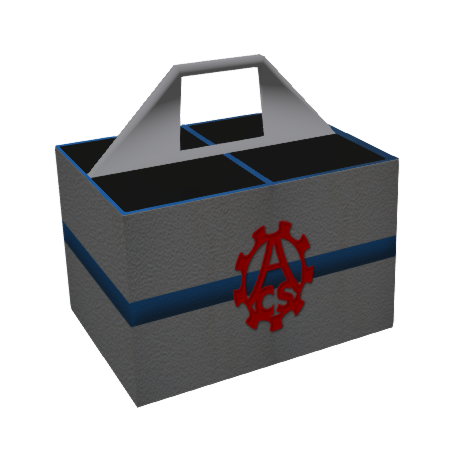 There will be one or two available in the Maintenance area at the Hub, but you’ll also be able to buy your own. ACS Charging Platform: Can charge units with the new ACS Battery Port, as well as with the older non-removable battery. 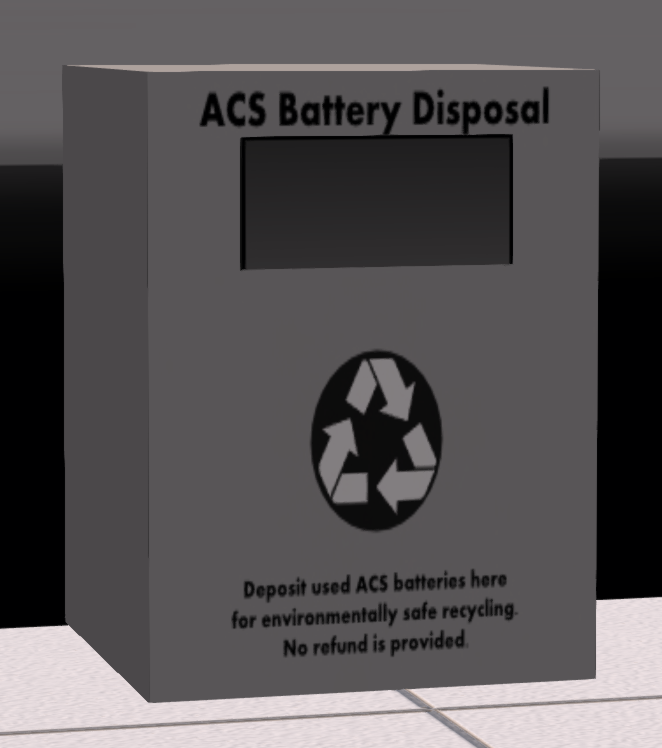 ACS Battery Disposal: Safely disposes of unwanted batteries. Nina, the ACS Receptionist unit: She will replace old batteries with new ones free of charge. Battery Boxes may be purchased for no more than L$10 each at the Hub. Each Battery Box may hold up to four batteries. Battery Boxes are transferable (with any batteries inside them), but not copyable. They may be rezzed on the ground or attached to the left hand. They do not wear out. Click any empty slot in the box. After a brief pause (2 seconds, or 5 seconds if the sim is slow), a dialog will appear listing the nearby batteries that can be taken, for example, from a Battery Vending Machine, another Battery Box, or a unit’s open Battery Port, for example. Choose from the dialog a battery to take. The chosen battery disappears from its current location and appears in the Battery Box. Click the battery in the box. After a brief pause, a dialog will appear listing all the nearby devices into which a battery of that class can be put, such as a unit’s open Battery Port, another Battery Box, or the Battery Disposal unit. Choose from the dialog the device into which the battery is to be put. The battery disappears from the Battery Box and appears in the selected device. You can operate a Battery Box that is attached to your avatar or rezzed on the ground. You cannot operate a Battery Box that is attached to another avatar without that avatar’s permission (unless it is a construct that is immobilized). To give others permission to use your Battery Box while you’re holding it, click its body. Batteries are not independent objects. A battery cannot be taken into your inventory or rezzed by itself; it exists only in an object. Select the desired battery type and life by clicking the corresponding button on the Vending Machine. The price of the battery will be displayed above the vending slot. The battery appears in the slot. Take it with a Battery Box by clicking an empty slot in the box. If you do not take the battery within a short time, it will disappear. You will not be refunded the purchase price if this occurs. From time to time, a Vending Machine may be set to provide batteries free of charge. When this is the case, clicking the vending slot may substitute for paying the price of the selected battery. This Battery Port is expected to be the most popular power supply. It allows the user to install a Class A Battery capable of fully powering the unit for anywhere from ten minutes to 24 hours (different battery sizes are available). The battery can be removed, carried in a Battery Box, and recharged outside of the unit. The battery can also be charged in the unit using a standard ACS Charging Platform. The Battery Port includes two attachments: a small Battery Meter to be mounted someplace on the unit where it is visible and accessible, and the Battery Port itself, which is designed to be mounted on the Spine. When closed, the Battery Port should be entirely hidden inside the unit’s body. Clicking the Battery Meter, then Open, causes the Battery Port to slide open, revealing the battery inside (if any). The unit can continue to operate with the Battery Port open, although ACS recommends keeping the Battery Port closed during normal use. Battery latch available: If checked, the unit can latch the battery port so it cannot be opened. This may help prevent unauthorized battery removal. Begin power conservation: When the battery charge gets low, the port signals the CCU to reduce power consumption in order to extend the battery life. This results in the unit’s movement and speech being slowed. The level at which to begin power conservation can be set to 1%, 10%, 25%, 50%, or 75%. Require standby during charge: If checked, the unit will automatically enter standby mode when it begins charging. This helps to preserve the longevity of your battery (see below). Activate after charge: If checked, the unit will automatically be activated when it finishes charging. Charge while offline: If checked, the unit’s battery is automatically charged while logged out of Second Life, at a rate of one second of charge for every two seconds of logged-out time. Standby/Shut down on discharge: If set to standby (recommended), the battery port always reserves enough power for the unit to remain in standby mode, even if there is not enough power for it to activate. If set to shut down, the unit shuts down completely when it runs out of power, and must go through its boot process when power is restored. Detachable: If not checked, the battery port cannot be detached by the unit even if its CCU is not bolted down. Once a unit’s battery is removed, capacitors in the unit’s power system allow it to continue operating for a few seconds. It will not always be possible for the unit to install a new battery in that time. It is therefore recommended that units do not attempt to replace their own batteries. Battery charge level and configuration are preserved when scripts are reset in the Battery Port, or when the battery port is detached. Class A Batteries are high-capacity, high-voltage batteries capable of powering any construct for an extended period of time. Class A Batteries are available in 10-minute, 30-minute, 60-minute, 2-hour, 4-hour, 8-hour, and 24-hour capacities, as indicated by the colored stripe on the end of the battery. (Capacities are approximate, as the unit’s activity level will affect how long a battery actually lasts.) Class A Batteries have a built-in charge meter on one end. If it is fully green, the battery is fully charged. The green bar gets shorter and is replaced by red as the battery is discharged. Over time, a Class A Battery’s life is degraded. This degradation is accelerated slightly by charging it in the unit, and more so by charging it in a unit that is activated (i.e. not in standby or shut down). However, even if not used at all, a battery’s maximum life will decrease by about half in about two months (so a two-month-old, fully-charged 4-hour battery will only power a unit for about two hours). ACS will hold Recycling Days approximately monthly, when old batteries may be replaced free of charge with new batteries of the same type. It is therefore not necessary to repurchase batteries every few months, although some owners will choose to do so for convenience. A schedule will be posted when it has been determined. Class B Batteries are small, medium-capacity batteries capable of powering a construct for a few minutes at most, or powering some of a construct’s low-power systems for a longer time. an extended period of time. Class B Batteries are available in 30-second, 120-second, 10-minute, and 30-minute durations. (Durations should be considered approximate, as the unit’s activity level will affect how long a battery actually lasts.) Class B Batteries have a built-in charge meter on one end. If it is fully green, the battery is fully charged. The green bar gets shorter and is replaced by red as the battery is discharged. Class B Batteries are designed for frequent or continuous charging, and do not degrade over time. There is therefore no need to recycle them. Click one of the four numbered recharging shelves. The Battery Box will fit itself into the shelf and begin recharging all batteries in it. You can confirm this by looking at the built-in charge meter on each battery. Once fully charged, a battery will be maintained at its maximum charge. Take your Battery Box back when charging is finished. This method of recharging a battery has the smallest effect on the battery’s lifespan. A battery may also be recharged while in a unit by having the unit stand on a Charging Platform. Version 1.0, 1.1, and 1.2 Charging Platforms can still be used. Recharging a battery while the unit it is powering is fully active (that is, not in standby or shut down) has the greatest impact on the battery’s lifespan. 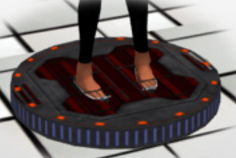 Charging Platforms can still be purchased at the Hub. From time to time you may wish to dispose of a battery – for example, to make room in your Battery Box for a larger or newer battery. To do so, simply put the battery into the Battery Disposal unit at the Hub. You will have a minute or so to take it back if you realize you have made a mistake, before the battery is deposited permanently inside the disposal unit. No refund is given for such disposal; however, you may rest assured that your battery will be disposed of in an environmentally safe manner.